Mid-Island Steel has all the tools necessary for Metal Hole Punching. Whether you are in need of custom parts or fittings for your own welding or iron work, or something else. Contact Mid-Island Steel to discuss if we can be of service! 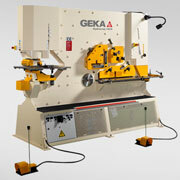 We can utilize our CNC Plasma or our Iron Worker machine to safely and accurately punch holes in most steel products.